Ask most business owners today what’s most important for their business and they’d tell you profit. Which is right. Most businesses pay little attention to the second feature and lose many potential and current customers in the process. How important are customer-centric habits to your business? Vision critical says that by 2020, customer experience will be the key brand differentiator, rather than product or price. Today, there are companies like Amazon and Zappos that make their service customer-centric to ensure they continue to satisfy their customers. In fact, it’s become a part of Zappos that superstar employees who don’t fit into their culture are fired! What habits can your business implement to satisfy your customers and keep them coming back? Many times, your company may try to satisfy your customers in ways you think you can achieve that goal. But often your idea of customer satisfaction may differ from your customer’s. And no offense, your customer’s view is the most important here. Listening to your customers help you to know what they need from your service and the improvements you can make. In a blog post, Stephanie Giesse complained about shorts bought from Target that were too small and would expose her daughter’s body. Target responded to her concerns and got her to work with them. This would include feedback about children’s clothes. With this, Target showed they took their customers’ views seriously. Live chat is one of the most effective ways of listening to your customers. And if you need one reason to use it, it's that customers love it. In fact, 73% of customers are satisfied with their live chat experience. Furthermore, users can interact with you while still on your website. Can this get better? Yes. If you combine live chat with co-browsing. With co-browsing, you have a visual format of your customers problems. Today, that's probably one of the best technologies that show a customer you care about them. Listening to your customers isn’t enough. You also have to follow up on their concerns. This is the first evidence that you’re really listening. This also shows that you care and that you’re trying to do something about it. This is one of the reasons customers love live chat. Because they can get a solution to their problems in a short time, compared to other channels. The average response time for live chat is 2 minutes which is much faster than other channels. However, live chat loses its benefits if you don't reply to your customers. That's why follow up is vital. Follow up could also be in form of replies to post comments or social media posts. It could even be sharing of survey results and providing an explanation on how you’ll tackle user’s concerns. Peter Shankman, a social media consultant, was to land in Newark airport in two hours. He tweeted, jokingly, that Morton should meet him with Porterhouse steak when he arrives. Lo and behold, a Morton staff met him with a porterhouse at the airport. Talk about follow up. In some cases, listening to your customers may not be enough. Because not every customer will tell you issues they’re having with your service or product. Some will just move to your competitors. This is why you must anticipate their needs and take steps to meet them even before your customer is aware of these needs. One way to do this is to have live chat prompts on important pages on your websites like sales or pricing page. By sending the first message, customers are more likely to open up about their issues. This is one of the steps you can take to be customer-centric. One major benefit of this, apart from having happy customers, is that it helps you to ward off competition from your competitors. You might even end up gaining some of their customers for pursuing customer’s interests. Amazon already delivers packages to customers in a day. However, during the last holiday season, Amazon increased locations eligible for this service from 5,000 to 8,000. This was to cope with the higher demand during the holiday season. We’d all love it if customers always make decisions based on logic. But the reality is different. Many times, people make decisions based on their emotions and then use logic to justify it. What feelings do your customers associate with your product or service? Your processes and policies should have a human feel to it. When you reply to customers, are you crafting your conversations like a chatbot? Your words need to show that you feel your customer’s pain as customers value this a lot of time. When you do this, you make your service much more than the product and transform it into a lifestyle. 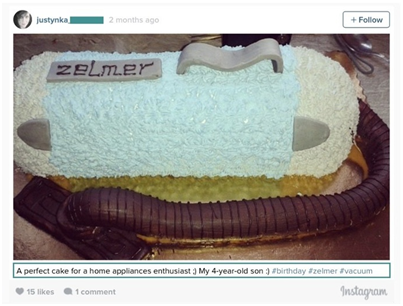 To celebrate the birthday of 4-year-old Wojtek, his mother made him a cake that looked like Zelmer vacuum cleaner as her boy was a home appliances enthusiast. Zelma responded and offered to give them a free tour of one of their factories to show them vacuum manufacturing. This may not directly be about the product, but it would bring a lot of joy to the mum and her boy. That’s one customer they probably won’t lose in a long time, or forever. For businesses to serve customers effectively, there is usually a need to have some important information about their customers. When customers release this information, they do so because of the trust they have in your business. Selling users information or spamming them with irrelevant messages may lead to loss of trust. And consequently, loss of customers. With a technology like co-browsing, one of the concerns customers may have is about their privacy. You need to assure them of this. Due to government regulations regarding privacy, O2 implemented a system that revealed to customers how their data is used to improve their service. This was to increase trust between the customers and the company. Your employees must have relevant knowledge about your services as this helps them to serve customers effectively. This could be through training your employees to use new features of your product. Likewise, you should also share your knowledge with your customers, especially about your products and new developments in your company. This could be blog posts about how to get the best out of your products. Or how to use your products to improve their lives. 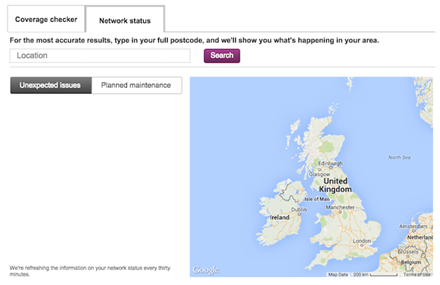 To reduce its network related queries, Vodafone UK made a graphical and interactive representation of its network performance. This led to a 40% increase in visitor traffic, 9% reduction in network related complaints and 54% reduction in escalated queries requiring a customer call back. To be a customer-centric organization, your employees have a big role to play as they have direct contact with your customers. Many businesses can’t deliver great customer experience because their employees are demotivated. In some cases, customers could be demotivated because of low pay or poor working conditions or restrictive policies. How does an unhappy employee listen to customers, meet their needs and make them happy? Even if they manage to do so, some customers could still stop doing business with you if they’re aware you treat your employees badly. Zappos has been ranked as one of the best places to work over the years. Because they give their employees the freedom to work and take decisions concerning customers. “So we generally try to stay away from policies, we just ask our reps to do whatever they feel is the right thing to do for the customer and the company. And that’s actually really uncomfortable for a lot of reps that come from other call centers. We kind of have to untrain their bad habits. These strategies have seen Zappos make sales of over $1 billion annually. 75% of its purchases came from returning customers and 43% of its new customers came through word of mouth. 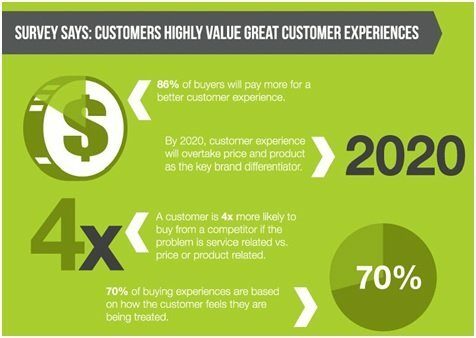 Great customer experience is a vague term and it means different things to different people. Even your employees would differ on what constitutes great customer experience. This is why there must be a system in place on how to improve customer experience. And it must be clear to every employee. What are the steps employees should take when interacting with customers? With a live chat app, you can gather enough information about what your customers’ challenges with your business. This will help you put a system in place to improve customer service. When Thomas Cook wanted to establish direct relationships with potential customers, they launched a targeted lead generation campaign and a travel survey to capture their information. This helped them to capture 15,000 leads during the campaign. When trying to improve customer experience, you have to be sure that your employees are taking the right steps. You also have to be sure that customers are satisfied with your efforts. You can have a supervisory team that makes sure employees are really taking steps to improve customer experience. Another way is to have a system that customers to rate their experience after engaging with your business. For instance, you can ask questions about customers’ satisfaction with their live chat experience after chatting with your customer care agent. "To keep a customer demands as much skill as to win one." Customer demands change over time. Sometimes, this could be because of a new trend or a different season of the year. Customer-centric organizations adapt to these changes as they occur. In another case, a big customer could need you to customize your service based on their tastes. Your business must be able to fulfill these requests if you want to continue to satisfy your customers. Despite its relatively fast same-day delivery, Amazon is working on drones to make 30-minute deliveries! This is to adapt to customer’s demands of faster service. This is one example of the many customer-centric technologies today. A customer-centric business pulls attention. The right kind you’d want for your business. First, you get a happy customer. And they’re so happy they tell their friend about it. Then you gain another customer. For a customer-centric business, this is a chain that could continue as long as you keep the culture. In the age of digital business, where losing a customer just takes a click to a competitor’s website, it’s in your business’ best interest to provide great a customer experience that they forget your competitors.